Prepare for the CEH training course and exam by gaining a solid foundation of knowledge of key fundamentals such as operating systems, databases, networking, programming, cloud, and virtualization. Based on this foundation, the book moves ahead with simple concepts from the hacking world. 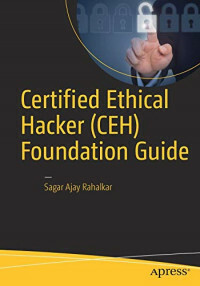 The Certified Ethical Hacker (CEH) Foundation Guide also takes you through various career paths available upon completion of the CEH course and also prepares you to face job interviews when applying as an ethical hacker. The book explains the concepts with the help of practical real-world scenarios and examples. You'll also work with hands-on exercises at the end of each chapter to get a feel of the subject. Thus this book would be a valuable resource to any individual planning to prepare for the CEH certification course. Beginners in the field of ethical hacking and information security, particularly those who are interested in the CEH course and certification. Modernize your IT skills for the new world of cloud computing! This book shows you how to use PowerShell to quickly pinpoint, diagnose, and solve problems with your Windows Server environment, reducing the need for external tools, and ensuring you stay up-to-date with PowerShell as it quickly becomes one of the most useful tools in an administrator’s toolkit.